Man City starlet Phil Foden was given the nod against Hoffenheim in the Champions League on Wednesday night, and Pep Guardiola evidently liked what he saw. The 18-year-old played his first full 90 minutes in the Champions League this week, and he didn’t disappoint as he played a key role in the 2-1 win at the Etihad. 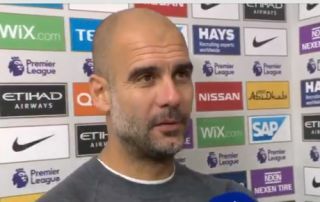 Although competition is naturally fierce at City as they continue to compete on multiple fronts at the highest level, Guardiola was delighted with what he saw and insisted that he believes Foden has a big future for club and country ahead of him, as seen in his post-match interview with BT Sport below. Time will tell if Foden does indeed get the opportunities to showcase his quality on a regular basis in the coming years at City, but on a positive note, training day in and day out with the likes of David Silva and Kevin de Bruyne also surely has its benefits. Not to mention the fact that working under Guardiola and learning from him will also help him develop and improve, and so it looks as though the future is certainly bright for Foden moving forward and his club coach is fully aware of the special talent that he has in front of him.